Previous version of Windows Phone have had great support for Exchange, SharePoint and Office but with no support for automatic file encryption or Mobile Device Management, they haven't appealed as business devices. However, the new Windows Phone 8 adds not just encryption but support for Information Rights Management (IRM) plus several key security features inherited from the underlying Windows platform that could make them much more compelling for business use. If you receive an email or try to open a document that's protected by the IRM tools in Windows Server, you can see that the message or file is protected and you can check what you can and can't do with it. If you're not allowed to forward a message because it's confidential, the Forward option won't even appear on the menu. The certificates required for this are automatically pushed to the phone when users set up their Exchange account so it doesn't require extra deployment. If you're deploying your own business apps to phones you can push both the certificate and a token to the phone so you can control who gets access to specific apps; that also allows you to manage Windows Phone 8 devices through Mobile Device Management (MDM) like System Center or Windows Intune. Using the Windows 8 kernel and platform technology means that Windows Phone 8 gets the same secure boot (checking certificates to make sure none of the boot components have been tampered with by malware) and the same SmartScreen phishing protection as IE10 on the desktop. Unlike the phishing protection on the iPhone which is only updated overnight if you leave your phone charging and connected to Wi-Fi, Windows Phone 8 SmartScreen is updated in real time (and it uses a cache of known phishing sites on the phone for faster protection). 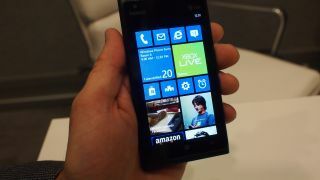 According to Microsoft, users are three times more likely to be phished on a mobile device (because it's harder to see the full URL and if the site doesn't look the way you expect, you're likely to blame that on the mobile browser), so SmartScreen protection could help set Windows Phone 8 apart – especially given recent security problems for Android. Other features will be welcome to business users as well as consumers, like Rooms. Setting up a group of people with a shared calendar, shared notes that are also synchronised into OneNote, shared photos and group messaging could be a good way to keep a team in touch. Most of the features are reserved for Windows Phone users, but colleagues with iPhone or Android devices can subscribe to the shared calendar and see the photos and OneNote pages through SkyDrive. Even Kids Corner is business friendly; if you use your phone to keep your children amused, being able to lock down the list of applications they can access while they're playing should stop them accidentally deleting an important email - or sending an inappropriate response.